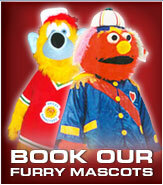 We are the Leaders in the Mascot Creations Transforming the Wonderful World of the Mascot. • Lifetime Warranty on the Head of the Mascot. • 3 YR. Warranty on the Body of the Mascot. • Our Mascot heads are lightweight, weighing a total of 2.5 to 3.5 pounds each. • Inside the Frame is a built-in baseball Helmet with a chin strap for stability. • The helmet is covered with a light-weight Softy Foam that is Durable and Breathable. • The performer will be able to see through the eyes, mouth, or neck, depending on the mascot design. • PROMASCOT can add the different gadgets like Confetti Poppers, Noise Makers, Blowers, and More!!! • All of our Mascot heads and accessories are Detachable Piece by Piece. • The Mascot performer will not be seen by the Human Eye. • The Mascot Eyes are capable of turning in a 360-degree motion. • Performers are able to wear their OWN shoes while inside the Mascot. • Shoes are then fastened by a Velcro system for Stability. • We only use High-Quality Materials for the construction of your costume. • Costumes are Breathable and light weight! • Durability ~ Will last 5-8 years. • Flexability, suitable for all Ball Park antics and stunts. • They provide comfort, mobility, and most importantly, SAFETY for the performer wearing the costume.